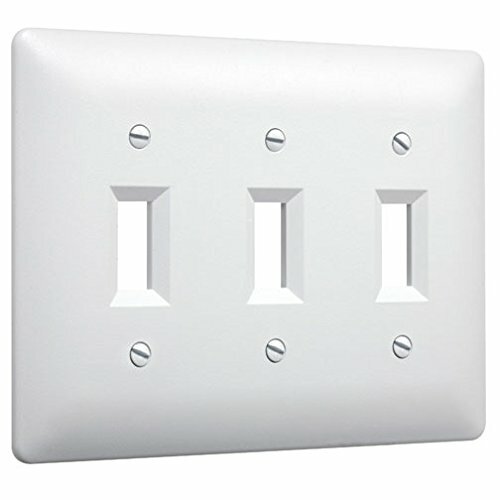 The TayMac multi-gang MASQUE wall plate for a triple toggle switch receptacle in white 4440W is easily wallpapered to match your walls or painted to achieve fantastic color. The masque wall plate series offers a fresh and modern approach to wall plate designs. In seconds you can create a new look or mask outdated and discolored outlets. The finish is specially engineered to hold paint and wallpaper, allowing the plate to match its surroundings. Also, try our line of decorator finished wall plates that come ready to improve the appearance of your room and are great for refinishing any area. The masque is an innovated approach to the ordinary electric outlet. With its recessed outlet enclosures and stylish hinged door they are designed to hide any electrical outlets while creating a clean wall surface and increased safety. The cover is made from a specially engineered material that is being marketed to interior designers, architects, homeowners, and residential and commercial builders. The masque is constructed for use both indoor and outdoor with a weatherproof rating while it is in use. Masque comes in a bone color which makes painting or wallpapering easy to match any setting as well as custom plates.